Inventory corrections can be used to adjust the in-stock quantity for a product. This might be used to correct the quantity of an item after a stock take or to write-off damaged items. When items are added or removed the necessary accounting adjustments will be made automatically. Items can be added in to stock manually or using the inventory import. In both cases a cost price must be provided so that the items are added into stock with a value. This value will remain with the item through until it is sold and cost of sales is recorded. Corrections should only be made for adding an opening stock balance and recording corrections where the stock levels have been identified as incorrect. Receiving purchase stock should be handled using a purchase order. Search for the product on the product list and click on the inventory level. In the pop-up window click on Add inventory for the relevant warehouse. Alternatively, go to Products > Add inventory and search for the product (if multiple warehouses are in use ensure the relevant warehouse is selected also). Click Add item. 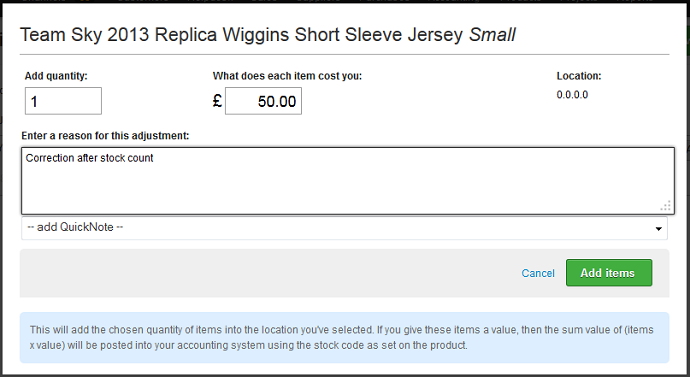 In the pop-up window enter the quantity to be added into stock and the value of a single item. This value will be used to create the accounting required to update the asset value. If warehouse locations are activated the location into which the items will be added is also displayed. Enter a reason for the adjustment. This will be recorded against the accounting journal and inventory audit trail. Click the Add items button to finish. Items can be removed from stock manually or using the inventory import. When manually removing items from stock the item is selected from the inventory detail report. The associated stock value will be used to make any corrections to accounting. Corrections should only be made for removing items where the stock levels have been identified as incorrect. Shipping stock should be handled using a sales order and the goods-out process. Search for the product on the product list and click on the in stock figure. In the pop-up window click on Edit/Remove inventory for the relevant warehouse. Alternatively, go to Products > Inventory detail and search for the product (if multiple warehouses are in use ensure the relevant warehouse is selected also). The inventory detail report is displayed with the item listed once for each different value, purchase order or location it belongs to. Hover over the line that is to be changed to see the edit icon appear next to the in stock figure. Click on the edit icon. Enter the quantity to be removed - this must not be greater than the in quantity on hand for the item on that row of the product detail report. A correction can only be made against one batch of items at a time. If multiple batches of the item have been received then multiple corrections may be needed. Enter a reason for the adjustment. This will be recorded against the inventory audit trail and the accounting journal. Click the Remove items button to finish. When items are added or removed from inventory, an accounting journal is automatically posted to adjust the asset value of inventory on the balance sheet. All stock movements are accounted for in base currency. When items are added into stock the values posted to accounting are the item price given at point of adding, multiplied by the quantity. 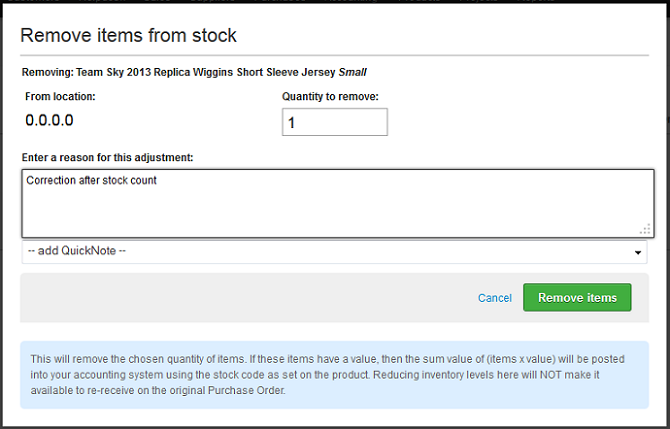 When items are removed from stock the actual value of the items removed from stock is used. The specific items must be chosen from the inventory detail report to initiate a correction. All stock corrections will affect the relevant account code chosen at Settings > Company > Accounting: Nominal codes. This makes it easy to traced the accounting journal directly back to a specific stock correction.